Making a gift look extra special for the recipient takes time and care. Pretty Handsome Guy would poo poo our efforts, but so be it. We had fun and that is all that matters! Using Martha Stewart craft paint and holiday stencils on plain brown craft paper. I set out some supplies, some water — and most importantly — Renee brought some Trader Joe’s Holiday Joe Joe’s! Mmmmm! We had fun wrapping and crafting and creating! I encourage you to invite a friend or two over to wrap with you this year. Enjoy some “down time” with some special friends. Or just pull up a chair in my dining room as I create a few more creative gift wrappings! Start by using the butterfly hole puncher and punch out oodles of little butterflies. Crease and fold the butterflies in half to give them some dimension. It is okay to leave a few butterflies flat. Gift wrap your present as you normally would. And add your ribbon and bow on diagonal corners. 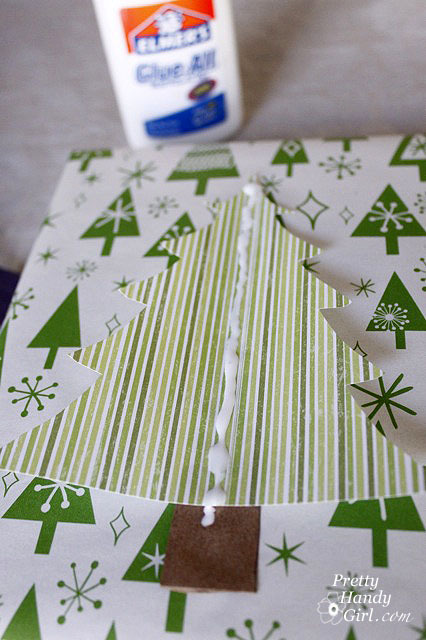 Use Elmer’s glue to place random dots onto your package. Lay your butterflies on top of the glue. Keep adding butterflies until your cluster is done. Add a snowflake embellishment and one butterfly on the bow. Think how adorable snowflakes or stars would look on dark blue wrapping paper! 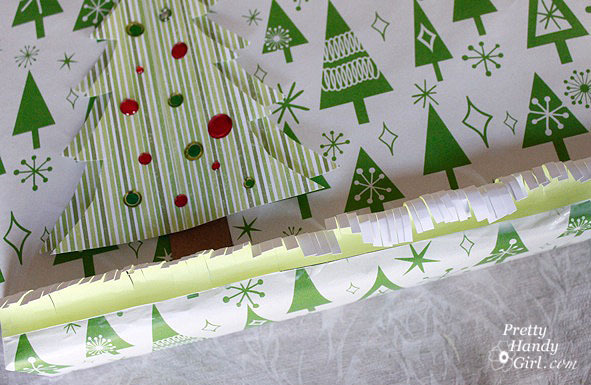 Wrap your gift in wrapping paper. …and cut along the fold(s) using the template below. When you are done you should have two identical trees. Glue the tree trunk down using Elmer’s glue. Run a bead along the spine of the tree and glue the first tree down on top of the trunk. Run a second bead of glue along the spine of the first tree and lay the second tree on top but slightly lower than the first. 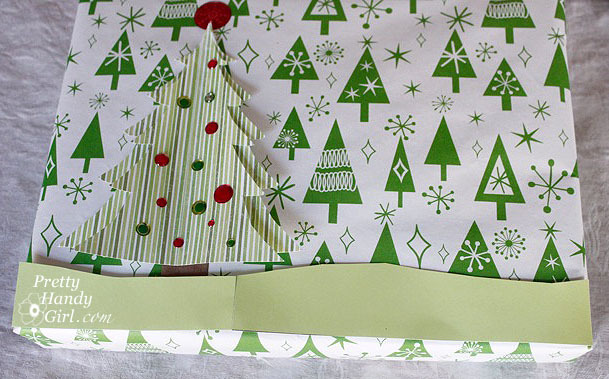 Fold the left and right sides of the tree up to give them some dimension. Add some embellishments or stickers to decorate your tree. Cut out a strip of green construction paper or scrapbook paper for your grass line. Tape two pieces together if you need to make it longer. Cut fringes into the top edge of the green strip. 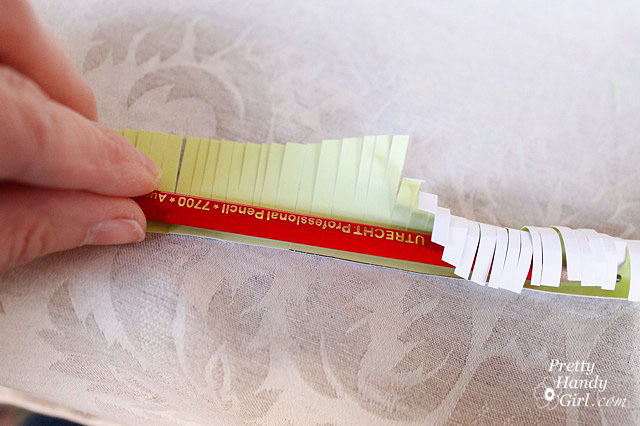 Using a pencil, roll the fringes over the pencil. I found this worked best on my thigh. Glue your strip of fringed grass onto the package using Elmer’s glue. Use your finger to push some fringes up and others down until you like the look. 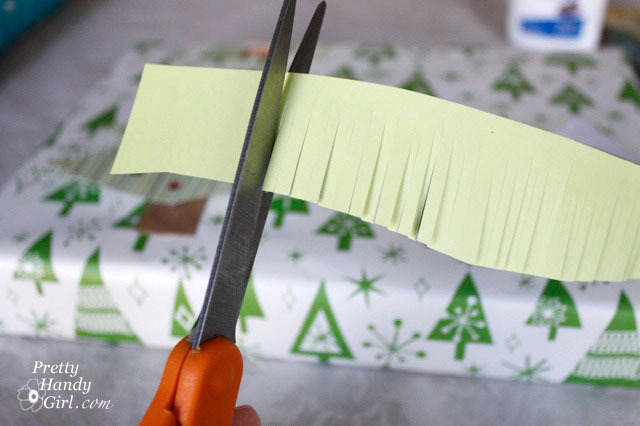 Finish off your package by tying some curly ribbon onto it. 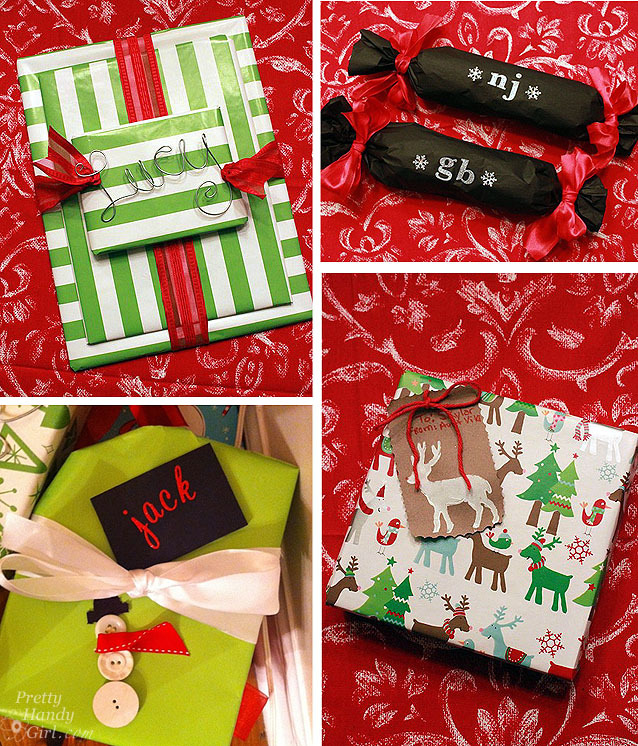 Please join me tomorrow for some more creative gift wrapping ideas! Looks like fun! Gifts look great. What are holiday joe joes? Gina, they are from Trader Joe’s. Oreos with crushed peppermint candies inside the white cream. 😀 Mmmm! They’re gorgeous! And it sounds like a fun way to take some down time. I feel like I’d cringe just a bit the moment it gets ripped off the gift! I thought so too. But, my 7 yr. old lovingly cut off all the fronts of his gifts last year. He kept them for months until I cleaned out his closet and threw them away. Shhhh! I need to get my wrapping started. Everything is waiting on my dining room table.I just need to get in there and tackle it. Having a few girlfriends around would make it more enjoyable. Wish we lived closer to gift wrap together ;-). This is such a fun idea! I’m a terrible gift wrapper, so adding a few embellishments should help hide the sloppies, right? 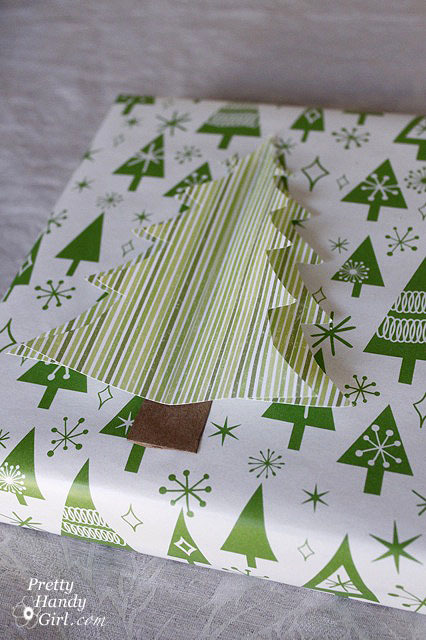 I just love this tree package…….I’m always looking for new ideas to personalize gift wrap for family and friends. I love to embellish their gifts and they seem to appreciate my efforts. I wonder how cute a small forest of the trees would be…??….??.. I’ll be sure to give you credit when I use it! Thanks so much for sharing your ideas and creative mind!! I wish you and yours a very Happy Christmas and a prosperous New Year!! I’m rather partial to the bent wire “Lucy” package, but they are all gorgeous. I, like your son, would be very careful to unwrap any of them, saving the bits. Hoping you have the happiest of holidays. Where can I purchase that EXACT butterfly cut out puncher?